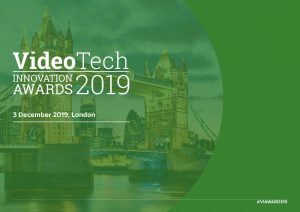 Interested in entering the VideoTech Innovation Awards 2019? The brand new VideoTech Innovation Awards from Digital TV Europe and sister publication TBI – Television Business International celebrate innovation in video services and the technologies that enable them. The awards honour the achievements of companies and individuals that bring video content to people worldwide. The shortlist will be announced in September and the winners revealed at the gala dinner in London on 3 December. Register your interest today to enter the awards!